At 37 weeks Caleb was born sleeping at 1:20am on Saturday the 21st of April 2018 in Grand Rapids, MI. 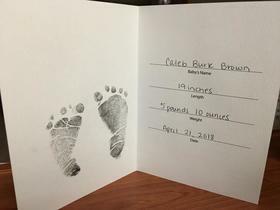 Caleb is the son of Rodney Cleve and Christine Brown (Burk) and brother of Jakob Cleve, of Belmont, MI. He was 5lbs. 10oz. and 19 inches long with a lot of hair. Caleb was the spitting image of his older brother. He is greeted in Heaven by his grandfathers, Cleve Brown and Walter W. Burk Sr., and mourned on Earth by his grandmothers, Fern M. Brown of Grand Rapids, MI, and Carmen H. Burk of Sarasota, FL, many aunts, uncles, cousins and so many dear friends. A private funeral service will be held at Assumption of the Blessed Virgin Mary Cemetery.